Queen's College of Food Technology and Research Foundation Aurangabad has advertised in LOKMAT newspaper for the recruitment of Teaching Faculty- Associate Professor / Assistant Professor Plus Non-Faculty (Clerk) jobs vacancies. Interested and eligible job aspirants are requested to apply as soon as possible from 20th June 2018. Check out further more details below. About College: QCFT is a premier Food Technology College nurturing genuine talent. A student at QCFT is continually groomed to become a future leader in the industry, capable of facing the challenges of industry - the advancing technology and continually changing business environment. 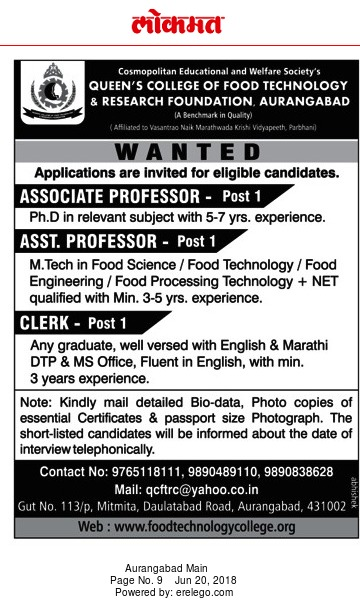 Reference: Advertisement from Queen's College of Food Technology and Research Foundation, Aurangabad on LOKMAT newspaper dated 20th June 2018 for the recruitment of vacancy position such as Associate Professor / Assistant Professor and non-teaching faculty (clerk) jobs. See the copy of advt below.